The Galápagos Islands, are an archipelago of volcanic islands distributed on either side of the Equator in the Pacific Ocean, 926 km (575 mi) west of continental Ecuador, of which they are a part. The group consists of 18 main islands, 3 smaller islands, and 107 rocks and islets. The archipelago is located on the Nazca Plate (a tectonic plate), which is moving east/southeast, diving under the South American Plate at a rate of about 2.5 inches (6.4 cm) per year. It is also atop the Galapagos hotspot, a place where the Earth's crust is being melted from below by a mantle plume, creating volcanoes. The first islands formed here at least 8 million and possibly up to 90 million years ago. While the older islands have disappeared below the sea as they moved away from the mantle plume, the youngest islands, Isabela and Fernandina, are still being formed, with the most recent volcanic eruption in April 2009 where lava from the volcanic island Fernandina started flowing both towards the island's shoreline and into the centre caldera. The islands are famed for their vast number of endemic species and were studied by Charles Darwin during the voyage of the Beagle. His observations and collections contributed to the inception of Darwin's theory of evolution by natural selection. The first recorded visit to the islands happened by chance in 1535, when the Dominican friar Fray Tomas de Berlanga went to Peru to arbitrate in a dispute between Francisco Pizarro and his subordinates. De Berlanga was blown off course, though he eventually returned to the Spanish Empire and described the conditions of the islands and the animals that inhabited them. The first navigation chart of the islands was made by the buccaneer Ambrose Cowley in 1684. He named the individual islands after some of his fellow pirates or after the British noblemen who helped the privateer's cause. 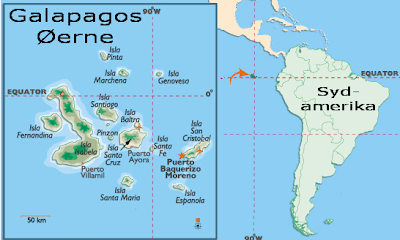 Ecuador annexed the Galápagos Islands on 12 February 1832 and today the Galápagos Islands and their surrounding waters form an Ecuadorian province, a national park, and a biological marine reserve. The principal language on the islands is Spanish. The islands have a population of slightly over 25,000. Santa Cruz hosts the largest human population in the archipelago, the town of Puerto Ayora.